While unintentional, the comments add to a number of media gaffes that have highlighted the need for sensitivity and awareness in covering cultural events. An Australian Olympic commentator is in hot water over poor phrasing during the aerial skiing on Thursday night. The comment attracted criticism from a number of watchers at home – some of whom had missed the earlier context about the jump style, while others maintained the poor phrasing about the jump style could come off as racist. After the event finished, Cooper, an aerial skiier with five world titles and who represented Australia at five Olympic Games, addressed the growing controversy. “Just finished the aerials, I’ve noticed a whole bunch of comments about my remarks re the Chinese. I need to make it clear I was talking about the jump. The Chinese are trained by one coach with one technique, their aim is all to jump the same,” Cooper wrote on Twitter. Business Insider reached out to Channel 7 for comment on the situation and whether Olympics commentators were provided cultural awareness training, but the broadcaster is yet to respond. While it appears the issue was just poor phrasing, it adds to a number of instances of insensitivity or mishaps by the media in covering Pyeongchang. During the Opening Ceremony an NBC analyst said “every Korean will tell you that Japan is a cultural, technological, and economic example, has been so important to their own transformation.” Japan, in fact, occupied the Korean Peninsula during the 20th century and oversaw forced prostitution and forced labour. NBC apologised for the comments. 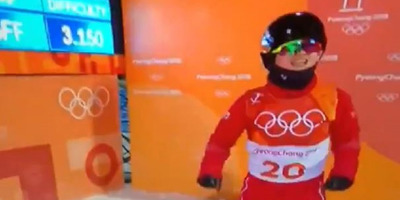 And a Chicago TV station accidentally replaced the host city’s name, Pyeongchang, with that of US restaurant chain P.F. Chang. The station also apologised. The blunders haven’t solely been confined to Asia. Kate Couric was mocked for saying ice skating is an “important mode of transportation” for people who live in Amsterdam due to its number of canals. However, the Dutch have things like cars they can use. Businesses have also made a number of blunders including confusingPyeongchang with the capital of North Korea, Pyongyang. The confusion is not new, and is why the city changed the spelling of its name for the games.